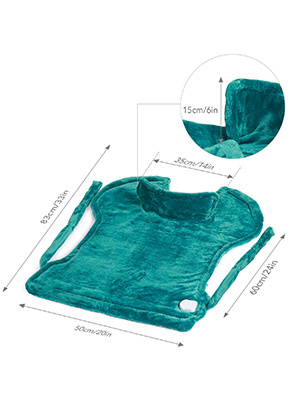 【Extra Large & Full-body Relaxation】 The wrap heating pad (24” x 33”) delivers penetrating heat to large body areas simultaneously to relieve fatigue and muscle stiffness or simply keep you warm in cold days; Designed specially to be worn around neck and shoulders, the heated wrap can be flexibly used on back, abdomen, legs, waist, and more. 【Hands-free & Ergonomic】 Magnetic clasp and slightly weighted edges help drape the electric heating pad naturally and snugly around the neck and shoulders for hands-free enjoyment; 2 straps (28”) further keep the pad in place for people with different physiques. 【Intelligent Heating/Timer Setting】 Choose among 5 heating levels for exact level of heat you desire; 2 timer settings (1/2 hours) promote safety guarantee and energy conservation; The long power cable (6ft) allows you to move around freely while relaxing with the wrap. 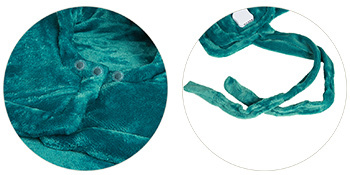 【Super-soft & Washable】 The flannel microplush hugs you with maximum comfort while helping distributing heat more evenly; The detachable controller and the washable fabric material help maintain the hygiene and softness of this washable heating pad. 【Safety & Warranty Assurance】 Overheat protection system and certification from CE, RoHS and Öko-Tex 100 guarantee better and safer user experience, and lifetime warranty for quality-related issues and timely customer service are provided, leaving you peace of mind, a great gift for friends, family, as well yourself. Heats within short time with fast heating technology. Large size provides warmth for large areas simultaneous like neck, shoulders, back, and more. 5 heating levels and 2 timer settings (60/120 minutes). Extra long power for use in a wider range. 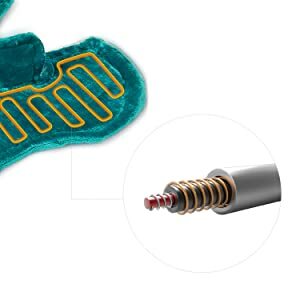 Removable controller and machine-washable fabric help keep the electric neck heating pad clean and soft. Slightly weighty edges with extra long strap design help fix the heat pad snugly on different users for comfort and warmth. Our product has obtained safety certification and is equipped with high quality dual-protection heating wires. When there is excessive heat from improper use, overheat protection will be activated to effectively prevent unnecessary safety hazards.